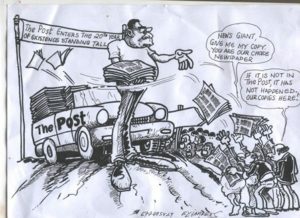 The launching of The Post on that historic July 11, 1997, was, indubitably, a sheer act of gamble. Or, to put it more bluntly, it was nothing short of lunacy. From all considerations, the project was unorthodox. Why create a bi-weekly newspaper without capital and without a plan? Its founding members, it seems, must have been suffering from an advanced state of dementia. If not, how can you explain such reckless braggadocio? The only explanation is that, somehow, through the inscrutable intervention of the Almighty, the time for The Post had come. That is why today, after 19 chequered years, we are still soldiering on. These have been 19 years not only of sorrow, trials and tribulations but also years of joy, ecstasy and exhilaration. In these 19 years, what have we not seen? We have seen it all: the bad, the good and…yes, the sordid. Despite the cataclysmic vicissitudes and the turbulent storms, we have endeavoured to remain calm, collected and committed. We have, perhaps, remained committed and united because of our passion to always be at the service of the people – our readers. In 19 years, we have contributed, we believe, in no small way, in writing some of significant pages in the noble profession of journalism in Cameroon. Also if our steadfastness has seemed impregnable, this is because we hold it as a self-evident fact that the first obligation of journalism is to search and find and disseminate the Truth. The notion of Truth is illusive but we have tried to capture Truth the way we have grasped it. Journalism, to us, also means that we owe loyalty, first, to citizens. We have operated with the conviction that good journalism serves as an independent monitor of power through the discipline of the verification of facts. We have not always succeeded. But we have tried. No doubt, we have had our own fair share of the national cake of challenges. But, we have used many of them as stepping stones in our resilience. For one thing, we did not divorce with our mission statement, namely, serving the Cameroonian people to the best of our ability. That is why we have survived the upsurge of crude competition in the newspaperscape of our country. We continue to walk tall even in the face of myriad challenges imposed by the social media and the craze of citizen journalism. We manouvre out of the miasma because we give priority to accuracy, not speed. The voyage in 19 years has been largely a saddening jeremiad. But also an exciting adventure for the crack team of reporters who remain a byword of the resilience and the passion. In motto maintains that we are “the independent at the service of the people. Thus, every time our spirits dim we are jolted to service because, as patriots, we believe that we strive to serve our nation through journalism to the best of our ability. Yet, the road to glory – that salvation of sorts, is still long and rugged. We sorely need your manifold support as we trudge along. Our heartfelt gratitude goes to our readers, advertisers and other partners. You are the kings and queens, the real owners of this newspaper. We count and rely solely on you for the rest our journey. We thank our detractors – immensely- for the wonderful role they have played in sustaining this project. They have unwittingly emboldened our resolve to succeed where failure seemed to be the only option. They caused us to learn how to meander through booby traps. From them, we developed the audacity of hope even in hopelessness. In all honesty, the challenges they posed to us were both a curse and a blessing. Those who have taken delight in denigrating and disparaging us, have been a jinx for misfortune and a mascot for success at the same time. We have always chosen the blessing side of the coin. That, clearly, is why we are still here today. Above and beyond everything else, we have chanted our mantra – Don’t Quit – with rapturous gusto. On the eve of our 20th anniversary, our dream remains big. With the original dream undiminished, we hope and look forward to a better, a more self-fulfilling and more prosperous future. We now take the appointment for the celebration of our 20th anniversary on July 11, 2017. It will be a momentous feat for stock taking. It will be time to look back with delight to examine the rivers we have crossed, that is, where we are coming from, where we are and where we are going to. And, finally, to God, our bulwark, we thank Him for helping us in His infinite mercy and compassion.